British Corner Shop® uses SagePay for totally secure online payments. SagePay use digicert for SSL encryption. Your card details are never stored by British Corner Shop. Transactions are carried out over SagePay's secure pages. The SagePay payment gateway is digicert secured. You will see the secure https:// prefix in your browser address bar, along with a padlock. Certificate details can be accessed. Depending on your browser, the address bar may also turn green. These symbols indicate a SSL (Secure Socket Layer), and means that browser communication is encrypted, and that your card details cannot be intercepted. 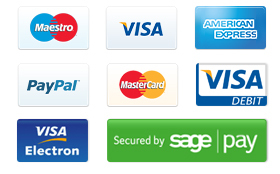 PayPal is also accepted, just select the PayPal icon at the first SagePay screen. When placing an order by card or PayPal, make sure you complete all four steps of the checkout process. At step 4, you will see 'Order completed successfully' after being returned to the British Corner Shop completion page. Do not close your browser mid-payment.